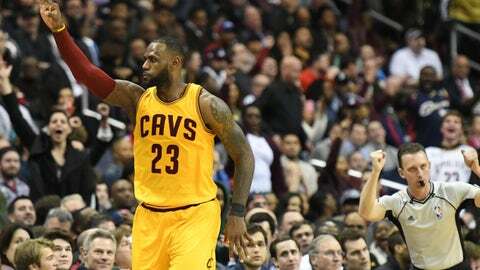 The Cleveland Cavaliers won a thriller in overtime against the Washington Wizards on Monday, 140-135. Could this be a preview of a potential playoff matchup? What a regular-season game Monday by the Cleveland Cavaliers and Washington Wizards. I’ve watched a lot of regular-season basketball in my 28 years, but this might be one of the best ones I’ve seen in a long time. From start to finish, this game was filled with action. The Wizards’ crowd at the Verizon Center gave it a playoff-like feel. Every shot and defensive stop felt like it was Game 7. It was one of those games where both teams had a little extra motivation to come out victorious. It was a contest where the Wizards were seeing how they matched up with the NBA champions and they proved they could hang with them taking it all the way to overtime. Bradley Beal, John Wall and Otto Porter showed that they could compete with the Cavaliers Big 3, but they were too much–even with Kyrie Irving struggling throughout the game and coming through at the end. It was the best game I’ve seen the Cavs play in a while. They still had lapses with transition defense, but they closed out when it counted most. This was also a game where the bench stepped up. Kyle Korver didn’t have a top scoring performance, but he made clutch shots in the fourth quarter and in overtime. He went 4-for-8 from long range and 4-for-9 total for the game.
.@KyleKorver, now 4-8 3pt FG (13pts) ties game at 127-apiece. Best regular season contest of the season so far. Cavs fans finally got to see why Korver is one of the best three-point shooters in history and why he was a valuable player for the Atlanta Hawks for the last five years. Cleveland Cavaliers: J.R. Smith Holds His Daughter Dakota For First Time! With Iman Shumpert likely to miss time with an ankle sprain, I’m curious to see what coach Tyronn Lue will do with the lineup. Will he start Korver or put DeAndre Liggins in there? Will this lead to them signing Lance Stephenson, who was part of the free agent tryouts? It’s a question that will have to be answered by Wednesday against the Indiana Pacers. However, the biggest highlight of the game–and who is surprised at this point–was LeBron James. He set another milestone in his great career. After becoming the youngest player to score 28,000 points on Saturday against the New York Knicks, he passed Hall of Famer Lenny Wilkens for 13th all-time on the career assist list at 7,227. I don’t know if he’ll ever catch John Stockton, who amassed 15,806 assists, over his 19-year career, but if he keeps it up at this pace, anything is possible. On the night he passes Lenny Wilkens, @KingJames w/career-high 17asst — also 29pts, 11-15FG. He followed that up by passing for a career-high 17 assist. But that wasn’t the only thing James did to impress the crowd in Washington. With only four seconds left in the game, James ran down the court, faked out the defense with his gather, and missed a wide open layup. Were the basketball Gods coming down on James for the infamous crab dribble play against the Wizards in 2009? Not on this day. The Cavaliers had to go the length of the court with three seconds left. Kevin Love–who had an excellent game was the inbounder. He threw one of the best outlet passes I’ve ever seen to James while he was on the right wing. James spun around on his pivot foot, shot a fade away from the three-point line, and banked it in off the glass. Grant Hill and Christian Laettner, eat your heart out. It rivaled the game-winning shot he made in the 2009 Eastern Conference Finals against the Orlando Magic–only the stakes were much higher then. I’ve been watching James since he came into the league in 2003, and he still amazes me with his play. He still has the same burst and lift he had at 18 years old. The other news of the game was a report in the New York Daily News that James asked management to trade for Carmelo Anthony even if it included Love. The Cavs have been linked to Anthony ever since rumblings began that the Knicks might be looking to trade him, but nothing has come of it. According to Joe Vardon of Cleveland.com, James dispelled any accusations. If rumors get Love playing like he did on Monday scoring 39 points and getting 12 rebounds, I know Cavs fans will take it. It was a game that NBA fans will remember for a long time. It’s definitely a playoff matchup I wouldn’t mind seeing this year. If the Cavs can continue to play with this effort minus the struggles on transition defense, they’ll be just fine with the remaining two months of the season.